Addendum; Ironically the DVD of the BBC series produced by Oxford Film and Television was never released for sale. Various recordings of the show were uploaded to YouTube but these became the subject of action under copyright and were either removed or the accounts were terminated. I was fortunate enough to be able to see it all before this happened. The Mona Lisa Curse is probably one of the most significant TV productions to come out of Britain in the last 10 years. Produced by Channel 4 as part of its Art and Money series, The Mona Lisa Curse is a timely intervention into the dialogue of contemporary art by critic Robert Hughes. I’ve lifted the best overview I could find of the show, from a posting on Mark Vallen’s “Art for a Change” blog site. It’s succinct and accurate and quite honestly something I didn’t have the time to do myself. 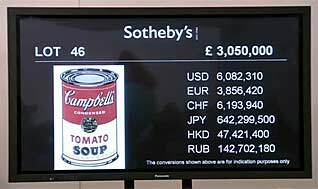 However what Hughes has to say is significant, particularly in times such as these when the art market has usurped the gallery system as the arbiter of the “value” of “art”. This is a good opener in terms of understanding the role of the critic in the art world and the role of a good critic as voice of conscience. “In these “postmodern” days it has been said that there is no more passé a vocation than that of the professional art critic. Perceived as the gate keeper for opinions regarding art and culture, the art critic has supposedly been rendered obsolete by an ever expanding pluralism in the art world, where all practices and disciplines are purported to be equal and valid. 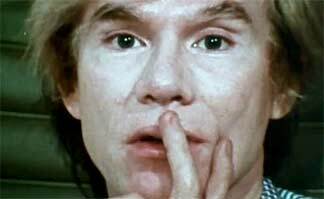 Screen capture of Andy Warhol from The Mona Lisa Curse. 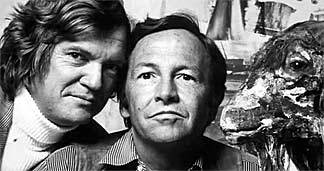 Circa 1960s photo of Robert Hughes and Robert Rauschenberg. Still from The Mona Lisa Curse. A single Warhol print on sale at Sotheby’s for a mere $6 million. Screen capture from The Mona Lisa Curse. 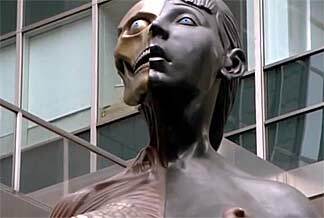 Damien Hirst’s “The Virgin Mother”, a 35ft-tall statue of a young pregnant woman.